Little Egg Harbor Township, New Jersey, U.S.
Gaten John Matarazzo III (born September 8, 2002) is an American actor. He is best known for starring as Dustin Henderson in the Netflix series Stranger Things. He has also appeared in a number of Broadway stage productions, including Les Misérables. Matarazzo was born in Ocean County, New Jersey. He has cleidocranial dysplasia (CCD), a birth defect he shares with his Stranger Things character. ↑ "'Stranger Things' teen star Gaten Matarazzo makes donation for rare genetic disorder affecting bones, teeth". Inquirer. October 30, 2017. Retrieved November 7, 2017. 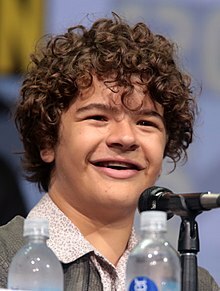 Wikimedia Commons has media related to Gaten Matarazzo. This page was last changed on 30 October 2018, at 10:56.